Chelsea began the season flying. The West London club won the first five games of the Premier League season in stellar fashion. They remained unbeaten in all competitions for the first three months of the season and Sarri became the first manager in Chelsea history to go unbeaten in his first nine league games. However, their undefeated streak ended in a pretty dire manner at the hands of London rivals, Tottenham. The quality of performance even before the Tottenham defeat had reduced somewhat with narrow wins in the Europa League and the draw at Everton showing the gradual decline in performance. The defeat at Wembley may have just been considered a bad day at the office by players, fans and pundits alike. 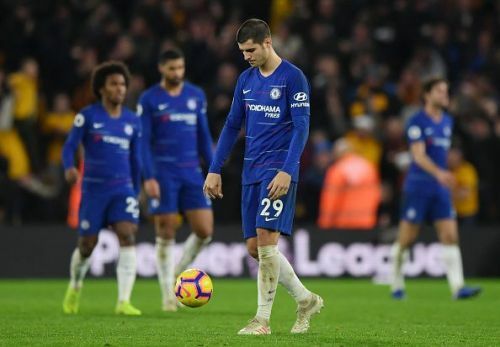 However, the laboured performance against Fulham and the subsequent defeat at Wolves are evidence of more deep-seated issues plaguing the Sarri revolution. Eden Hazard started the season on the bench as a precaution considering how far he went at the World Cup. His cameo appearances off the bench were truly remarkable and Sarri eventually eased him into first-team action. Hazard stormed into Golden Boot contention with 7 goals whilst also recording 5 assists. The 7 goals and 5 assists were all by matchweek 8 in early October. In the 7 matches since October 7, Hazard has claimed zero goals and one assist. It is no surprise that Chelsea have dropped 10 of the 21 points available. This period has also seen the gap to the pacesetters, Manchester City extend to 10 points after matchweek 15. The form of Eden Hazard is vital to the success of Chelsea. His decline in recent weeks has seen them lose points and slowly drop down the table.